Miniature Schnauzer Daisy practicing a down stay request. 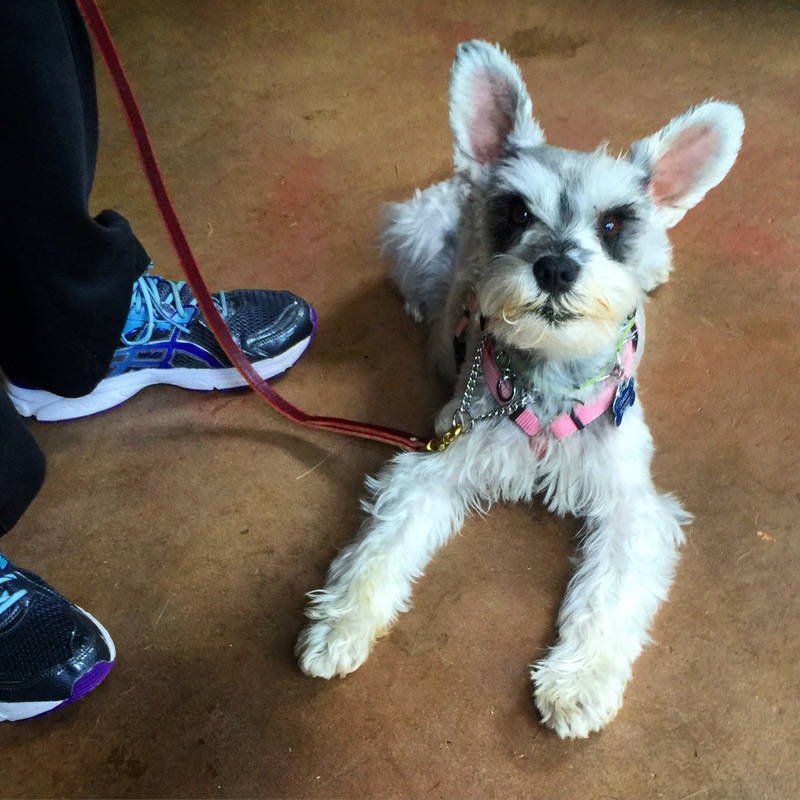 When I first met Miniature Schnauzer Daisy she was a frightened and severely anxious dog. She would bark at common noises in the home with intense excitability to the point of nipping. Her leash reactivity towards other dogs manifested in protective energy that could easily slip into aggression. Her veterinarian had prescribed anti-anxiety meds, with limited success. When I evaluated Daisy, I knew I could help her. She had incredible food drive, was super smart, with a quick wit, that gave her enthusiastic training energy. I enrolled this precious girl and her guardians in my confidence building course. We began working on changing her ideas about the world, and establishing solid obedience, mixed with fun games. By the end of our course, Daisy was a transformed dog– her anxious energy had been successfully channeled into her obedience and she had moved into alignment with her human guardians. After her training program was completed Daisy’s guardians worked with their veterinarian to wean her off her anxiety medication– she is now drug free! It’s been a rewarding training journey making such a dramatic change in Daisy. Daisy can now accept the presence of other dogs without aggression. Today we finished our classes with Mr. Kabler. I can’t begin to tell you how our family life has changed. 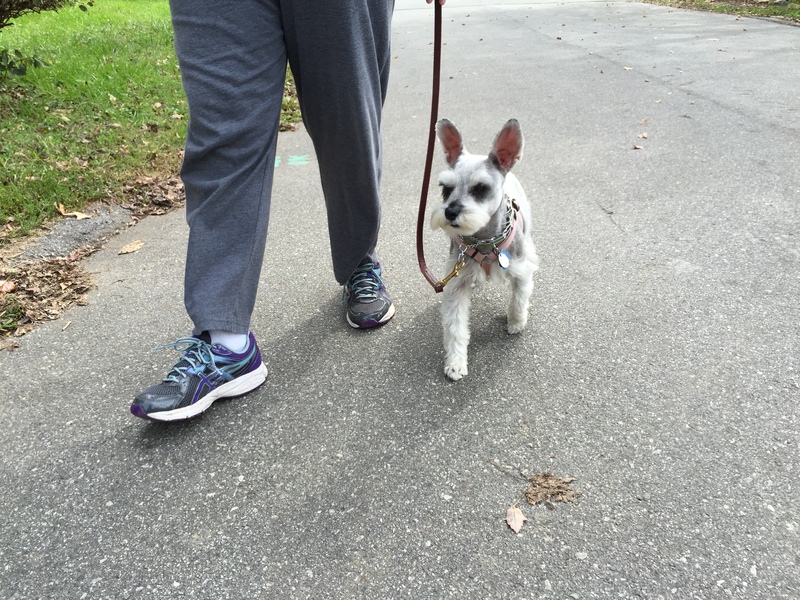 Our Daisy is a wonderful 5 year old Miniature Schnauzer. Most people didn’t see her that way. They shied away from her and felt she was harmful. She barked as if she would attack although she has never been aggressive. I admit I was a little wary of her around my grandchildren. Mr. Kabler met with us and evaluated Daisy. He told us she wasn’t vicious, she was just excitable. This made us feel so much better. Daisy acted out in fear not aggression. He felt confident that he could help us and alleviate some of Daisy’s anxiety. Before working with Mr. Kabler, Daisy could not be around other dogs or people. Reasons were as discussed above. I could tell when we were on a walk that she wanted to play with another dog. It was so sad. She would go up to a dog but then lose it and began to bark harshly. This in turn scared the other dog away. Daisy was very lonely. Another problem we had with Daisy was doorbells and the ringing of the telephone. She would bark, run in circles and nip at the person trying to answer it. It really was a hard time in our home. Daisy was put on anxiety meds twice a day to help calm her down, but we saw she was getting worse as time went on. We decided to listen to Mr. Kabler and signed up for classes. This was the best decision we have ever made. Today Daisy is a very happy dog. Her anxiety level has drastically lessened. In time, perhaps meds can be reduced. She can now walk with us in the neighborhood and allow people to pet her. She also goes up to other dogs and sniffs them a few seconds and walks away without barking. We can also get to the phone without fear and actually get it before the caller hangs up! I never would have believed others see Daisy as we do, a loving sweet and VERY smart dog!! Because She has done so well with other dogs these days, we have a new addition to our family. A little Morkie called Zoey. Daisy helps us to train her. They have become best friends. This would not have been possible before Mr. Kabler worked his magic. Enclosed is a pic of Daisy with Zoey, her best friend. Again thank you Mr. Kabler. Daisy out practicing her loose leash walk in the neighborhood.